Today i will show you how to make a simple clock with a RTC and a TFT LCD for Arduino. Simple project for beginners, it can be assembled and set up for less than 30 minutes. 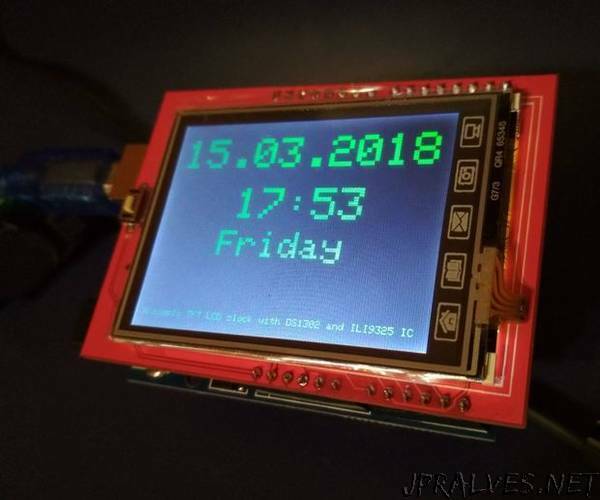 A few months ago i decided to make myself a simple clock with this 2.4 inch LCD. This RTC module is relatively inexpensive and very easy to use with Arduino. It is not like the ones that uses the I2C protocol(DS3231, 1307) . The module has 5 pins: VCC, Ground, RST, CLK, DAT The 3 pins can be connected to any digital pin of arduino. The biggest advantage of the rtc is that it is not using the I2C(SCL,SDA) BUS. The biggest disadvantage: The rtc chip is not heat compensated. What does it mean?? It means that the temperature most likely has an effect on the time drift. On room temperature the time drift was 2-4 minutes per month. Therefore we can not say this is a precise rtc.